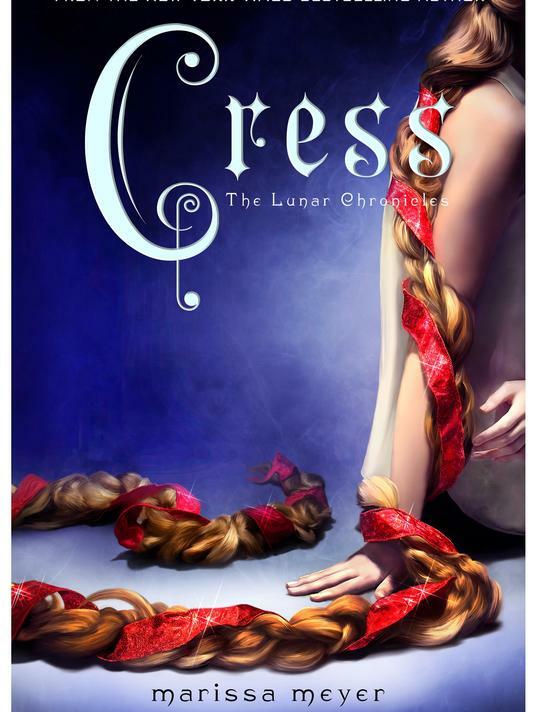 Today, USA Today revealed the cover of Marissa Meyer's third novel Cress. The third installment in the Lunar Chronicles series, this one follows the mysterious girl we met near the end of Cinder and is (as expected) a retelling of Rapunzel. I have become a bigger fan of Meyer's scifi retellings with each entry. Given my unreserved love for Scarlet, I am fairly champing at the bit to get my hands on Cress. A computer hacker trapped in an orbiting satellite? Brilliant. Coverwise, I really do love the whole theme Feiwel & Friends has going on with this series. While Cinder's cover remains my favorite (nothing beats a cyborg leg in a red slipper), I get a little thrill from each one. Which cover is your favorite? Admittedly biased, I love the Scarlet cover something fierce. This one is eye-catching, absolutely. But seeing it now? When the book's release is still so far off? Tormenting. Ugh, I know. Sorry about that . . . Very cool cover. So far I love this series - I can't wait for this latest! Hmm, favorite cover - hard choice! Me, too! SCARLET is my favorite book in the series, but that slipper gets me every time as far as covers go. Cinder is my favorite too because of the shoe but I love the hair on Cress (after adoring Tangled's twisted retelling) and am super excited for this new installment. Agreed. The hair is great. And I love the incorporation of the red in each one. Wow. Great cover. Marissa must be jumping for joy at the series covers. Right?! The cover gods have smiled upon her. Oh wow, I LOVE this!!! Could be my favourite of the three (I love Rapunzel, no idea why really, just do! ), though I love Cinder too. I still haven't read Scarlet yet - have it, just haven't got around to it yet. You haven't?!! Shannon. Get thee to SCARLET. It's my favorite! Ugh. I'm so sorry about the Captcha. I get spam like crazy and so felt forced to have it on. Any suggestions for a workaround? It's a tough call between Scarlet's cover and this one, but I think I like this one a teensy bit more. Yeah. Both great. I love her cape in Scarlet. And the hair in this one . . . :) I can't wait to really meet Cress. oooh so excited to discover your blog today. we read the exact same books.